Today at the Annual General Meet of Reliance Industries Limited, Reliance Chairman Mr. Mukesh Ambani announced the roll out of most awaited Reliance Jio 4G network to public. Since last year, everyone was waiting for this and along with this announcement he has announced various other exciting news and updates, that will revolutionize the Indian telecom industry and will bring a digital revolution. The Reliance Jio Infocom Limited has announced that from September 5th onwards, everyone will be able to get a Jio SIM card with the new Jio Welcome Offer, which is just the same as Jio Preview Offer and will let users use Jio Digital Services for free along with free voice, data, and SMS up to December 31st, 2016. But now let’s start from the basic. How to get a Reliance Jio 4G SIM card? No need to bar codes, no need to do anything on your phone. Just visit any Reliance Digital Store and grab a Jio SIM card. You don’t need to worry about anything as you will get the Jio Welcome Offer which will offer you quite a lot of things. Students can use their student ID to get additional 25% data with Jio. You don’t need to pay anything for it. In India, people have been witnessing blackout days on the occasions of different festivals. During these selected days, SMS is charged at regular tariff even if you have an SMS pack. But Jio won’t ever charge you extra on blackout days and you will be able to enjoy the benefits bundled with your plan. Recommended: Reliance Jio FAQ – Everything you need to know! There are various plans, which you can check below. But in the case of data tariff, Jio 4G is the cheapest. Where other telecom operators like Airtel or Vodafone charge Rs. 250 for 1GB of data, Jio will offer the same for just Rs. 50. That means, if you have account balance and you ran out of data pack, you won’t be charged much. You can enjoy uninterrupted 4G speed for a cost of just 5 paisa/MB or Rs. 50/GB. If you have a VoLTE enabled phone, there is no issue. You can grab a Jio SIM card, pop it in and enjoy. Otherwise, you can buy an LYF smartphone. The LYF smartphones are priced as low as Rs. 2,999. Those who are willing to have Wi-Fi for home use can get Jiofi which is priced at Rs. 1,999. And the good thing is that you will get Jio Welcome Offer for any device, irrespective of brand, price, features or anything else. If you’re having an Adhaar Card, which is the all in one ID card issued by the Government of India, you can just walk into the store. Show the card and the enrollment into Jio 4G will take just a few minutes. Also, Read – Reliance Jio Launched – Everything you need to know! Reliance Jio Infocom has claimed that they are offering the 4G VoLTE services at the cheapest prices, in the whole world. 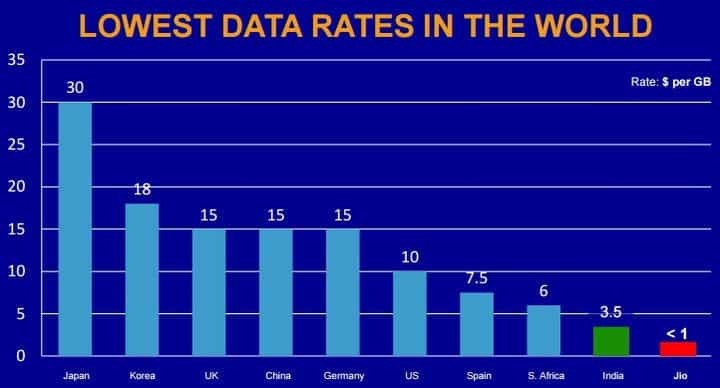 Here’s a chart that shows what 1GB of data costs in other countries and also in India. As you can see, right now in India, 1GB of 4G data costs around $3.5 or around Rs. 250, whereas Reliance Jio 4G will offer the same for even less than $1. For consumers that plans start from as low as Rs. 19 and goes up to Rs. 4999, for heavy data users. Mr. Ambani also stated that currently there are over 22,000 tariffs all across India and they want to simplify the tariff with the help of 10 main plans which are well balanced in terms of voice, data and SMS, along with Wi-fi. Well, let’s take a look at all the plans and pricing for smartphone users. Plan 19- This is the cheapest plan a user can have. This plan is valid for only one day but offers quite a lot of things. No matter whether you are in home network or roaming, all the local and STD voice calls to any network will be free. However, in the case of video calls, you will be charged from the data pack itself. You will get 100MB of 4G data and unlimited data from 2am to 5pm. You will also get 200MB Wi-Fi data for using at Jio hotspots. That’s not the end- you will also get 100 SMS for free. And of course, the Jio Apps Services are free, but data usage charges will be applicable and as you keep using, the data pack will get deducted gradually. Plan 129- This plan is quite similar to Plan 19 which extended data allowance and validity. This plan is valid for 7 days. And the plan will offer 750MB of 4G data and unlimited night data (from 2am-5am), along with 1.5GB of Wi-Fi usage and 100 SMS. Plan 149- This is a monthly plan (28 days) and will offer 300MB 4G data and 100 SMS per month along with unlimited voice calling to any phone. But it does not offer any night data benefits or Wi-Fi usage. However, it is good for those who rarely step out of office or home Wi-Fi and use mobile data just for WhatsApp and texting. You get 100 SMS, valid for one month. Plan 299- This plan will offer 2GB of 4G data and 4GB of Wi-Fi usage for 21 days. You will also get unlimited night usage (2am-5pm) and 100SMS per day for 21 days. All other benefits will be provided including Jio Digital services, though data usage will be counted. Plan 499- This plan will offer 4GB of 4G data and 8GB Wi-Fi usage, along with all the benefits like 100 SMS/day, jio digital services, unlimited night data with a validity of 28 days for prepaid and 1 month for postpaid users. However, if you travel around the world, you will get discounted ISD tariffs in 61 countries when you roam. Plan 999- This plan is same as Plan 499, except the data usage allowance. You will get 10GB of 4G data and 20GB Wi-Fi usage allowance with this plan. However, everything else will be same as Plan 499. You will get 100SMS/day, discounter ISD tariffs and unlimited night data. The plan is valid for 28 days for prepaid users and 1 month for postpaid users. Plan 1499- This plan is great for those who travel abroad and don’t want to miss anything. Jio will offer 20GB of 4G data and 40GB Wi-Fi usage allowance. along with that, you will also get 100SMS/day, unlimited night data, discounted ISD tariffs. But, not just discounted ISD tariffs are being offered, Jio will provide you 30 minutes of ISD calling and 28 days validity (for prepaid) and 1 month (for postpaid) for this plan. Plan 2499- This plan will be same as Plan 1499 in terms of free SMS, night usage and discounted tariffs. But you will get 35GB of 4G data and 70GB of Wi-Fi usage allowance, along with 50 minutes of ISD calling. This plan is valid for 28 days (for prepaid) and 1 month (for postpaid). Plan 3999- This is same as Plan 2499, but offers 60 GB and 120 GB of usage for 4G and Wi-Fi respectively. Along with the plan, you will get 80 minutes of ISD calling along with all the additional benefits like night usage, 100SMS/day and discounted ISD tariffs. Th plan is valid for 28 days (prepaid) and 1 month (postpaid). Plan 4999- This plan will offer a mammoth 75GB of 4G allowance and 150 GB Wi-Fi allowance. Along with that, you will get 100 minutes of ISD calling, free night usage, 100SMS/day and discounted ISD tariffs. This plan is also valid for 28 days (prepaid) and 1 month (postpaid). So, these are the things you should know about Reliance Jio 4G- from device compatibility to plans, pricing and a lot more. We will keep you updated. And if you have any queries, please drop them below in the comments section. 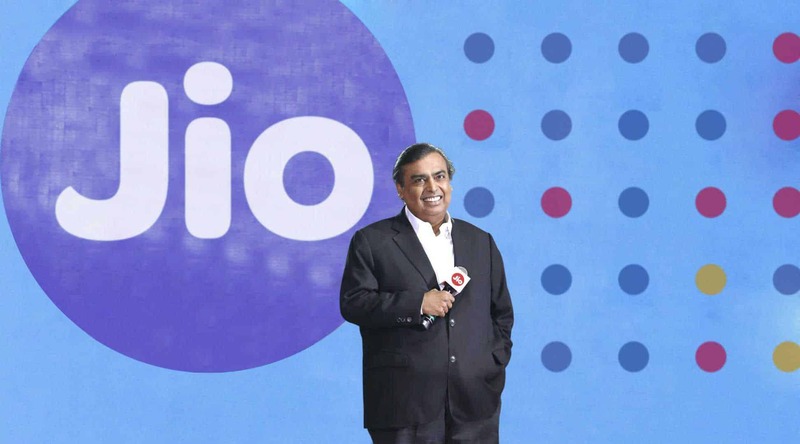 Previous articleReliance Jio Officially Launched – Everything You need to know! Next articleAsus to celebrate Ganesh Chaturthi with Exciting offers! Reliance Jio Officially Launched – Everything You need to know!